With your family, co-workers, students, community. DVDs with Screening Licenses and discussion guides are available for purchase based on your intended use. Please purchase the most appropriate license for you. If your screening group does not fit these licenses, or you would like us to help organize your event or lead a Q & A please contact us @ witnessdocfilms@gmail.com. Yes! If you are showing the film anywhere outside your home, you are legally obligated to purchase the appropriate package and license for your institution. We review all purchases to confirm correct licensing. 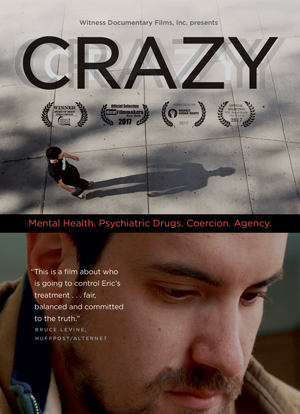 Our prices are based on industry standard rates set by leading documentary distributors. Our goal is to make the film accessible to all types of organizations. As independent filmmakers, we rely on your support to keep producing great documentaries and making them available to the public. All of the proceeds from our sales go directly into paying our staff, producing new content, and distributing it to you. A DVD for your personal use. If you plan on showing the film anywhere outside your home, you are legally obligated to purchase a Screening Kit and appropriate license. Screening Kit includes DVD, discussion guide and a license for a private screening. 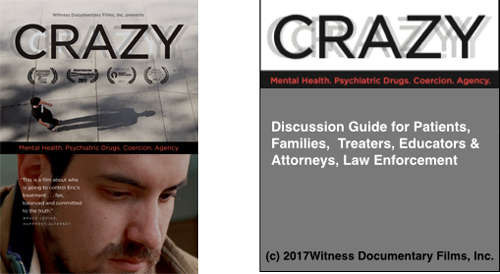 This license is valid for people in the mental health system and their families who want to screen at a private home (20 people or less). Screening kit includes DVD, discussion guide and an academic/library license for your institution. This license is valid for teachers, librarians and counselors at middle schools, high schools and public libraries. Screening kit includes DVD, discussion guide and a license to exhibit the film at your facility. This license is valid for all non-profits, businesses, religious institutions and community organizations. You can show the film as many times as you'd like in one facility. Screening kit includes DVD, discussion guide and an academic license for your institution. This license is valid for professors and librarians at colleges, universities, technical schools and medical schools. Screening kit includes a streaming version of film available for university screenings, discussion guide and Digital Streaming License. Click BUY NOW to purchase the streaming video on Vimeo. Screening kit includes DVD or digital copy of the film, custom digital evite, listing on our website and social media support. This license gives Public Performance Rights to individuals, groups or organizations who wish to charge for tickets, ask for donations, seek sponsorships and retain all revenue from the event.